Few statements pertaining to writing are more true than this one. Infallible logic expressed here. Infallible. Your first draft is going to be a mess. You can read all the writing posts you want, study every book on the subject, reach the point where you feel you know what you’re doing, and even then, you’ll often want to use your first draft as bird-cage liner. Kitty litter. Fireplace tinder. And it will be that way every single time. Why? Because every novel you write is going to present its own challenges. Your first novel presents the challenge of just finishing the thing. The second is often more difficult than the first, especially if you’ve been studying the craft and trying to become a better writer. As time goes and you get more novels behind your belt, you find other aspects of the craft that need honing. Eventually, certain things become second nature. You recognize when you’ve erroneously shifted the POV or you need more descriptive detail or your scene isn’t moving the plot. But there’s always something—there will always be something—that needs work. Sharpening. Shaping. Omitting entirely. That’s the nature and the beauty of the first draft. Not only is it kitty litter, it’s a learning tool. If you don’t recognize what needs work, someone you trust will happily point it out to you and explain why it doesn’t work and how to make it better. You learn. You begin to watch for it in your next novel. Eventually, you add it to the list of things you can do by rote. 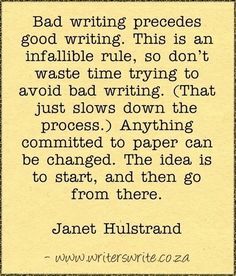 So, in truth, even if you tried to avoid bad writing, you won’t be successful in that first draft. Not everything is going to be perfect in that first round. Here’s another tidbit: as you study and improve, you’ll discover that you have a whole new definition of “bad writing,” and if you take the craft seriously at all, you’ll be harder on yourself with each new novel you write. If you’re not careful, you’ll get stymied by trying to do the impossible: write a perfect first draft. The harder you try, the more stymied you’ll become until you can’t get past the opening scene. So accept it. It’s not like you haven’t heard it before. That first draft is going to be kitty litter. Embrace it. Relish in the thought that it’s not carved in stone. It can be fixed. It can be changed. But first, it has to be written. This entry was posted in write tips, Writing, Writing Tips and tagged first draft, Writing. Bookmark the permalink. I hear you! I tend to edit as I go, and as a result, I’m angry at the story right about the midpoint. Hate the thing. Hate sitting down at the computer. But each and every time (and that’s through 7 mysteries), it comes out okay. I hate throwing work down in a quicker first draft. Like nails on a chalk board. Wish I could do it, but I want that sucker to sound good before I leave one chapter and move to the next. That’s me. Can’t progress past Ch 1 until Ch 1 is perfect. I’ve gotten better about it (you know my Ch 1 wasn’t perfect! ), but still, I have to have it polished up a bit before I can move on. Right now, I’m trying to rewrite the first five chapters so I can finally progress to Ch 6! I’ll always try for perfection, but it’s so elusive!